Dr. Nakatsuka is a native of Orange County, growing up in North OC before migrating south in adulthood. After finishing high school, he moved on to the University of California at Santa Barbara, where he earned a Bachelor of Arts degree in Cell Physiology and Cell Biology. It was at this time where he made his mind up to start a career as a health professional. Dr. Nakatsuka received his Doctor of Dental Surgery degree from the University of Southern California School of Dentistry. After graduating from dental school, Dr. Nakatsuka proudly served in the United States Navy as a Dental Officer. During a four year commitment, he earned several honors including the “Commanding Officer’s Award for Clinical Excellence” and the “Navy Achievement Medal”. It was during this time that he earned the status of a U.S. Veteran, serving during Desert Shield and Desert Storm. 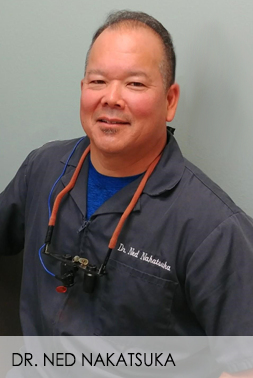 Since leaving the US Navy, Dr. Ned has enjoyed private practice in Aliso Viejo, providing quality dental service to his patients of Aliso Woods Dental. Dr. Ned enjoys the outdoors with his family mostly on the water either fishing or at the beach surfing, paddle boarding, or hanging out. He also enjoys listening to analog stereo spinning the vinyl discs at home.